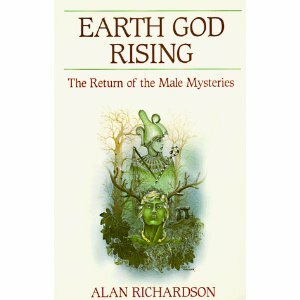 Richardson’s Earth God Rising is a book that aims to detail the male mysteries by exploring aspects of male divinity. I feel that in some ways it fell short of the mark, but it still has many redeeming features. In modern paganism, the feminine mysteries are given more focus, leading some male pagans to ask “where are the male mysteries?” Many books have tried to answer this question, but pretty much without exception I’ve found them to be all lacking for one reason or another, either because they focus primarily on one religious system, or they have one target audience, usually adolescent males. While those books are needed and do have their place, a book that can be read by a more general adult pagan audience is also needed. I was really hoping that Earth God Rising would fit that bill. The book itself focuses on the masculine divine, in the context of the Egyptian mysteries, the Arthurian legends, and “The Horned God.” Specifically, Richardson mainly focuses on the God Osiris and the Celtic Horned God in this writing. He obviously has a background and interest in both Egyptology and Celtic studies. This, however, is where I feel the book falls short. Although he engages in a discussion of the Egyptian masculine divine and the Arthurian legends at much length, I didn’t feel that Richardson provided any grand insights. In short, I felt as if it was just a retelling of these legends that any seeker who is interested in them could find elsewhere in much greater detail. Considering the majority of the book is spent in these retellings, I found this a great disappointment. One of the reasons that I decided to review this book is because the back cover synopsis specifically talks about The Horned God. Being a devotee of this deity myself, this was a great draw for me. There are very few books that talk about The Horned God in terms outside of being a generic nature God, or in terms of personal experience. For me, this is where the bright spot of this book is located. At the very end the author gives an account of his personal experiences with this enigmatic deity. Suddenly the writing shifts focus, and instead of sounding like a half-hearted analysis of mythology, Richardson’s passion for his topic starts to shine through. I almost felt as if this section was written by a different person. In my opinion, this section is well worth the price of the entire book. I found myself moved by Richardson’s story, nodding along in many places where our experiences were shared. This was particularly true for me when he spoke of Herne coming into one’s life at a time of discord and remaining at the periphery, catching glimpses of him here and there. I found this to be very much on target. Also particularly poignant was a choice he was offered between joining the world of the Fae, and the high price he would have to pay to do so (which is seldom mentioned in today’s market of books, which often leads one to believe that interacting with the Otherworld is somehow safe, sanitized, and convenient). At the end Richardson gives instructions for contacting Herne using an inner grove meditation which will be instantly familiar to many of the Druidic persuasion; I myself have used this means to contact him in the past with excellent results. I found very little of value in terms of “male mysteries” here, but if you are looking for a decent book to read up on Egyptian and Celtic mythology, or are looking for ever elusive information on the Horned God, than I would recommend this book, especially given that you can find it relatively cheap on Amazon. If the latter is your goal, I would also advise that you check out two other books. Horns of Power (Avalonia Books) edited by Sorita d’Este is an excellent source book in relating personal experience with the Horned God. It does not focus solely on Cernunnos/Herne, but rather includes other horned Gods such as Khnum and Pan, as well as a section on horned Goddesses. Also,Visions of Vanaheim (Gullinbursti Press) by Svartesól should be mentioned. Although it is primarily about the Vanir, it has a chapter on Herne with personal experiences and some of the most evocative prayers I’ve seen for him yet. In a world that has such little written about this God from a worshipper’s perspective, both resources are gems for the devotee of the Horned God.